Nelle Peters designed the Laugh-O-Gram building. She's considered one of Kansas City's most prolific architects. A view from the roof of the building. Butch Rigby (at left) and Jeremy Knoll (at right) observe as master mason, Dan Stewart, demonstrates tuck pointing technique. In the 1920s, Walt Disney and his animators acted out a scene on this spot on the roof. "One of the earliest lessons I learned in my non-profit work is the difference between a monument and a movement," says BNIM project director Jeremy Knoll, who started working with Butch Rigby, chair of the nonprofit Thank You Walt Disney in 2012. Knoll is also the co-f0under and chair of Historic Green. "And this building has the opportunity to be both, to be both a monument to the legacy of Walt Disney, but also part of a movement into the 21st century," he says. This has been a really long process. Butch, you've spent a lot of time and effort in stabilizing the building. What's the status of the building now? Butch Rigby: "Around 12 years ago, 13 years ago, we had the opportunity to prevent the Laugh-O-Gram Studio building from being torn down. It was brought to our attention that it was on the city's demolition list. We knew the historic significance of the building. We were able to get it removed from the teardown list. We were able to purchase the property. And we started a fundraising campaign with Walt Disney's daughter, Diane, assisting to stabilize the building, and stabilize meant really take a building that had already crumbled in on itself - the roof was on the second floor, the second floor was in the basement. "We were effectively able to rebuild the building, and all the time, we were able to preserve the office where Walt Disney stayed ... We brought the building to what we call a cool shell, and that is making it ready for programming and for use. But the biggest challenge over the years has been doing this a little bit at a time. So now, we've reached a point where we'd like to program the building, and we have been approached with a marvelous partnership opportunity to do it." Out of the (2012 student) design competition came the idea of this building taking shape as a (digital) storytelling center, but also rehabilitating it in a green way. Could you talk about the challenges of a green building? Jeremy Knoll: "Well, the legacy we're trying to live up to with this building is Disney's legacy of creating the intersection between commerce and imagination. While he did wonderful things in the early 20th century, with a completely new field, what we are looking at today, at the beginning of the 21st century is the challenge of sustainability, the challenge of our survival. "I think the innovation and commerce intersection can take place here again, progressing that legacy through creating one of the nation's greenest buildings by following the Living Building Challenge, LEED Platinum, and other criteria to help us, even just as a guide to begin with. To determine how a building like this can operate with no net energy, no net water, and create no net waste." Recently, the Mid-America Regional Council provided funding for a feasibility study. Is this the next step in the progression going forward? Butch Rigby: "Precisely. We have got to really look at the scope of what we would like to do. In addition to this building, there will be some new construction. We would hope there will be some revitalization of other historic and existing buildings on Troost, in order to make this thing happen ... First, the study, then the next part will be fundraising for a larger construction and rehabilitation." With Historic Green, you've helped rally some people or create awareness about activities, and also bring out people to help with clean-up. Is that a role that you see for yourself going forward? Jeremy Knoll: "I will say that it has been both Historic Green and the U.S. Green Building Council chapter locally that have worked in partnership to bring together young people, contractors, engineers, architects to sort of dream what can happen here. But, beyond dreaming, actually pick up a shovel and help clean up and actually make it better today, so that when we get to the construction tomorrow, it's that much less work to do. "As we get into the design and construction work, especially with Disney's studio, I think one key role that Historic Green will be able to play is by bringing in some of the nation's leading preservation experts, to look at the materials, to look at the cut of wood, and to help re-create exactly what was there in his studio. So anyone coming to visit can get a true picture of what that looked like." The costs have been estimated between $2-6 million. If you had to create a timeline, what's your dream of how this will play out? Butch Rigby: "The (feasibility) study will take the rest of 2014. So, during that time, we'd like to go in to the building and do a little more restorative work ... make the building a little more tight and presentable to the neighborhood. And then we would look forward to some results by the end of 2014, so that we could begin a capital campaign in 2015. "And depending on how long it takes to raise that money, I'm going to imagine you'd another 24 months to at least get the building itself up and going. If this is a bigger project, it might take a little longer than that, depending on new construction, things like that." Jeremy Knoll: "And I can certainly see building it in phases as well. Getting the study done by the end of this year, while starting design by the end of the year, would be my dream for what would happen here. "Spend five to six months on design and community engagement ... and begin to align those dreams of the potential of this place can be, such that we are looking at really clear construction numbers by the end of 2015. "With the idea that the Laugh-O-Gram building itself is the core construction in a campus of development. That would be step one, but we're always looking at step two or three or four, that makes this into sort of the beating heart of creativity in Kansas City." 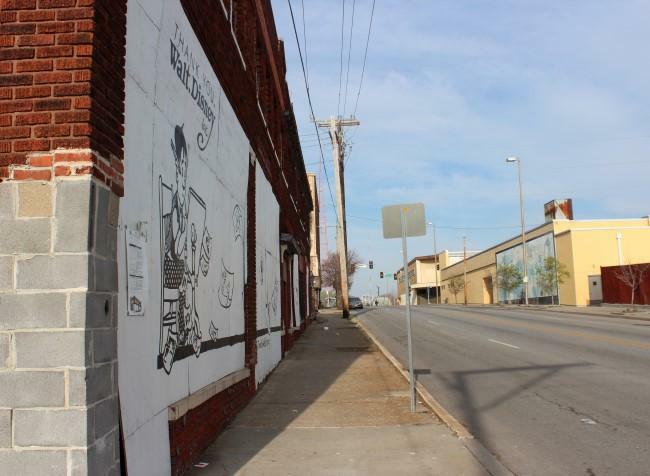 An attempt to breathe life into a building near Troost Avenue with ties to Walt Disney could help erase the corridor’s stigma as a key dividing line in Kansas City, says Butch Rigby. 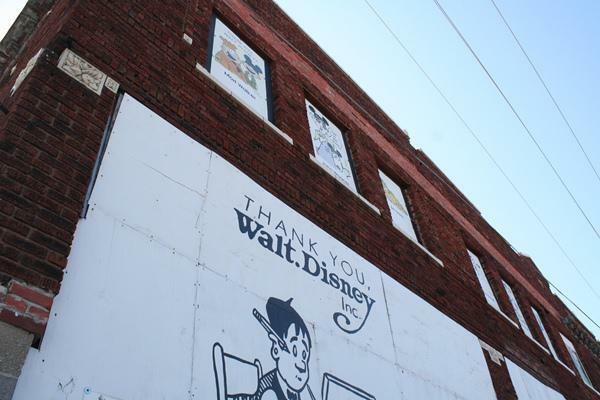 Rigby, chairman of the non-profit Thank you Walt Disney, is behind an effort to revitalize Laugh-O-Gram Studio, which is just east of 31st Street and Troost.